In his studio in Connecticut and Chatham, Massachusetts, James primarily creates marine paintings inspired by sailing and navigating the waters of New England. James has observed firsthand the many changing faces the ocean presents as the light, sands and waters react to the ever changing environment. As an avid plein air painter James divides his time between painting landscapes and coastal studies and larger studio pieces he develops from his plein air studies. James graduated from Vesper George School of Art in Boston class of 1966 with a focus on design and fine art and attended classes at the University of Hartford and the Boston Institute of Architecture. James is an elected artist member of the following: The American Society of Marine Artists, The Salmagundi Art Club NY, NY, The Allied Artists of America, The Copley Society of Boston and the Lyme Art Association. James’s professional affiliations, along with his great appreciation of French and American Impressionism provide him with the background necessary to create his vibrant and expressive paintings that capture the mood and spirit of his subject. As a professional artist, James devotes all his time to painting and exhibiting. His work is in numerous private and corporate collections in the United States and abroad. Robert Noreika is a graduate of Paier School of Art and has been a professional artist for thirty-five years. His passion for art is matched by a natural talent to paint a wide variety of subjects, highlighted by expressive coastal scenes, intimate woodland pictorials and seasonal treks through the countryside. He has been inspired by the many pleasurable memories of his boyhood; which was spent joyfully fishing, and catching turtles and frogs. A prominent national award winning artist and illustrator, Robert's paintings hang in both corporate and private collections throughout the United States, Europe, and Japan. His painting Catfish and Turtles is in the permanent collection of the New Britain Museum of American Art. He is represented in numerous galleries and teaches and lectures throughout New England. He has illustrated magazine editorials and seven books. He is an elected member of the National Society of Painters in Casein and Acrylic, the Salmagundi Club, the Lyme Art Association, the Connecticut Watercolor Society, the Connecticut Plein Air Painters Society, the Connecticut Academy of Fine Arts and he is a signature member of the New England Watercolor Society. So far in 2012 Robert Noreika has already won two significant awards including the Robert Sanstrom Prize - $5,000 and GOLD MEDAL, at the National Society of Painters in Casein and Acrylic, and the Second Prize Award at the National Open Show of the New England Watercolor Society. Awards in 2011 include a first award in the New England Watercolor Society's regional show at the Attleboro Museum as well as awards at the Salmagundi Show in NYC and from the New Haven Paint and Clay Club. Initially a science teacher, Barbara has always considered art her passionate hobby. In 1983 she started studying at the Lyme Academy College of Fine Art where she earned several scholarships. In 1987 she gained elected artist membership in the Lyme Art Association, Old Lyme, CT with her painting of a rose that won First Prize. Soon after, she attained elected artist membership in the Connecticut Watercolor Society and the Mystic Arts Center, Mystic, CT. Elected artist membership in the oldest art organization in America, the prestigious Salmagundi Club in New York City, came in 2001. Barbara is the author of Artist’s Projects You Can Paint, 10 Watercolor Tablescapes Loose and Light (2005) and a contributing artist for the book, How Did You Paint That? 100 Ways to Paint Still Life and Florals (2004) both published by International Artist Publishing. She has taught art at the Lyman Allyn Museum, New London, CT and the Lyme Art Association, Old Lyme, CT. Her Watercolors of Capri have been made into posters by Grand Image, Seattle, WA and are available online. Barbara’s paintings can be found in private collections across the USA and abroad as well as in the permanent collection of the New Britain Museum of American Art, New Britain, CT.
William G. Hanson is a graduate of American University with a B.F.A. in Studio Painting. As an illustrator, he has worked for magazines and major publishing houses (Simon & Schuster, Signet, Dell, and E.P.Dutton). His portraits include a Chief Justice of the Connecticut Supreme Court, corporate and banking executives, and a series of portraits of past winners of the Masters Tournament for Golf Digest. In current years, his love of the sea and its lore has influenced his choice of subject matter. 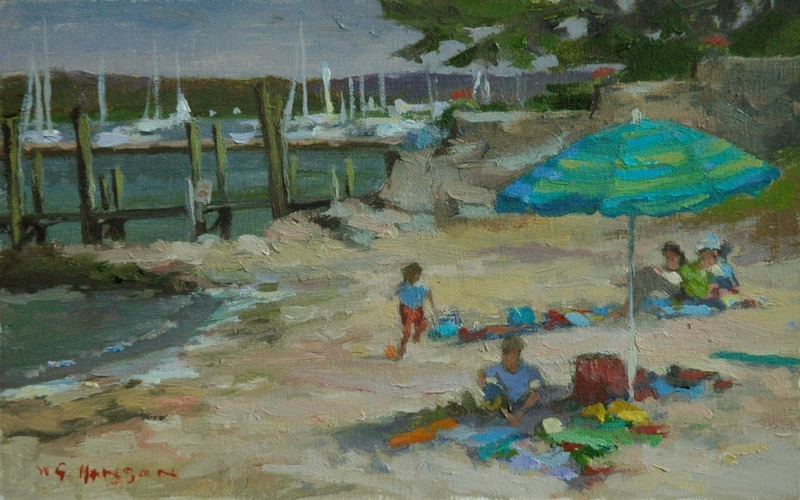 Hanson is a signature artist member of the American Society of Marine Artists (ASMA), the New England Plein-Air Painters, and an elected artist of the LAA and the North Shore Arts Association. He is an annual participant of the International Marine Art Exhibition and the Modern Marine Masters Exhibition at the Maritime Gallery at Mystic Seaport. When not in his studio, Hanson can be found painting and sketching the coastline, countryside and people of the Atlantic shore and small towns and back roads of New England.